My collection of audio/visual/computer gear. 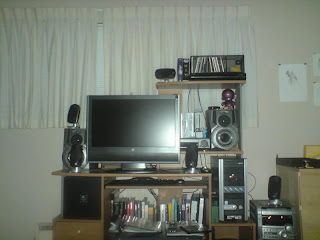 Over the years i've put together a pretty good setup in my bedroom- 27" lcd, 5.1 speaker system, hd-dvd player, wii, bookshelf stereo set, and my awesome desktop. When i'm controlling it all from my harmony remote i'm in a little bit of heaven. My room is a sanctuary for gadgets and i have so much fun getting everything just right. And yes, there's a vcr in there too.